It’s not always easy to prepare a healthy, light, and satisfying dinner, especially on a weeknight. (It’s further compounded when you’re a carbohydrate loving Italian girl.) Tonight Todd went to the grocery store, and unbeknown to him, came back with the extra ingredients for a Nicoise salad. As it happens, I do not care for hard-boiled eggs in my salads and I did not have tuna, but chicken. This salad comes together quickly if you work in the following order: put a medium saute pan over medium heat. Then dice the potatoes, cover with water, put the lid on, and bring to a boil. Then slice the chicken, season, and place seasoned side down in the hot oil. Wash your cutting board and knife well, and then slice your olives. By this time the chicken is about ready to turn, and you should give the potatoes a stir. Then prepare the dressing, and about a minute or so later, the chicken should be removed to a plate to rest, and you can add the green beans. Check the potatoes with a fork; when the fork slides in easily, the potatoes can be drained. Toss with about a quarter of the dressing. Pile the salad on two plates and dress it with half the remaining dressing (divided between the two plates, of course). The beans should be done, and you can arrange the toppings on each plate and top with the remaining dressing, and serve. You will find more direction below for this salad. You’ll be satisfied and surprised you never thought of it before. 4 red potatoes (small-medium), about ¼ lb. 3 Tbsp. Olive Oil + 1 Tbsp. Lay the sliced chicken breast pieces out cut-side up and sprinkle with salt, pepper, and a light sprinkle of Herbes de Provence. Drizzle about 1 tablespoon olive oil in the hot pan and lay the seasoned side of the chicken down into the pan. Season the other side of the chicken the same way. Cook until the chicken is golden – approximately 4 minutes. Turn and cook about 4 minutes more, until golden. Set aside. Juice the lemon into a small bowl – will be about 3 tablespoons juice. Add Herbes de Provence and slowly drizzle in the olive oil while whisking. Once emulsified, season to taste with salt and pepper. Note: If your lemon does not produce enough juice, either use a second lemon or reduce the amount of olive oil. Set aside. Scrub the potatoes, and slice into ¾ inch equal cubes – approximately 8 pieces per potato. Place in a small pot and cover with cold water. Bring the water to a boil and cook until tender – approximately 8 minutes. Drain the potatoes and toss with approximately ¼ of the prepared dressing. Set aside. Once the chicken is done and the pan is still hot, toss the green beans in to cook. Continue tossing until cooked – about 5 minutes for frozen haricot vert. Divide the greens between two plates, and drizzle half the dressing on both plates. 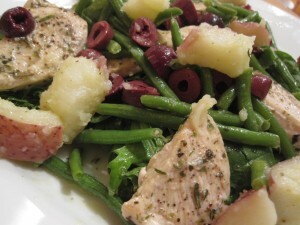 Then arrange each plate with half the chicken, haricot vert, kalamata olives, and potatoes evenly. Drizzle the remaining dressing evenly on each salad, and enjoy. * Hericot vert are available at Trader Joe’s in the frozen section.